While the series of cave paintings in Borneo were discovered in 1994, recent analysis has dated them back to around 40,000 years ago. The painting is the first figurative painting in the world. The Guardian quoted Maxime Aubert, an archaeologist, and geochemist at the Griffith University in Queensland, Australia, as saying, “It is the oldest figurative cave painting in the world. It’s amazing to see that. It’s an intimate window into the past.” The faded, cracked reddish-orange image depicts a rotund but slender-legged animal, presumed to be a species of the wild cattle which still roam the island. Given that the animal is slashed with a straight line at its side, which researchers say could depict a spear, it is evident that the artist was hungry at the time of drawing his masterpiece. Aubert, an associate professor at Australia’s Griffith University, worked with a team in remote and inaccessible caves in the East Kalimantan area of Borneo to date the paintings. The team, whose research was published in the journal Nature on Wednesday, looked at multiple layers of artwork painted on top of each other. The bottom-most and oldest layer featured paintings of animals, mostly a local type of cattle, as well as hand stencils in a reddish color. The Guardian reported that the animal is one of a trio of large creatures etched on a wall in the Lubang Jeriji Saléh cave, which is located in the province of East Kalimantan in Indonesian Borneo. 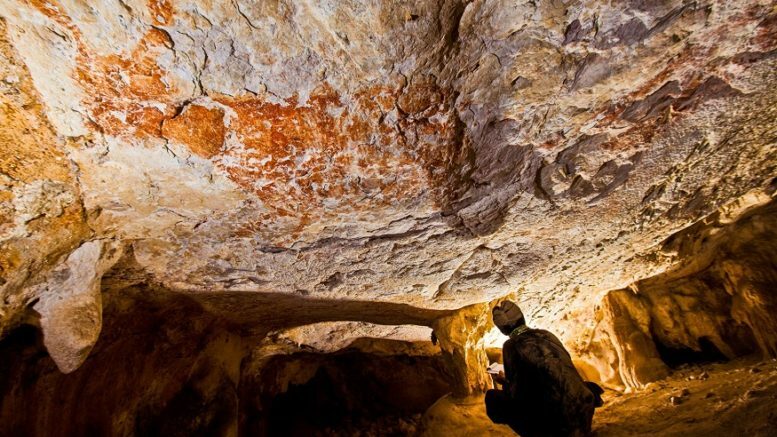 The region is known for its ancient rock art, which comprises thousands of paintings dotting the limestone caves, and has been studied since 1994 when the first drawings were spotted by French explorer Luc-Henri Fage. While this is arguably the world’s first figurative painting, rock art itself is thought to have begun much earlier, when Neanderthals decorated the walls of caves in modern Spain much before our first human ancestors reached Europe. In September, researchers revealed their analysis of a 73,000-year-old lump of rock, marked with a crisscross design, which was discovered during the excavation in a cave in South Africa. Be the first to comment on "World’s oldest-known animal cave art painted at least 40,000 years ago in Borneo"